Nowadays, it is not surprising to find out that many businesses need all kinds of documents and sheets to do their jobs. 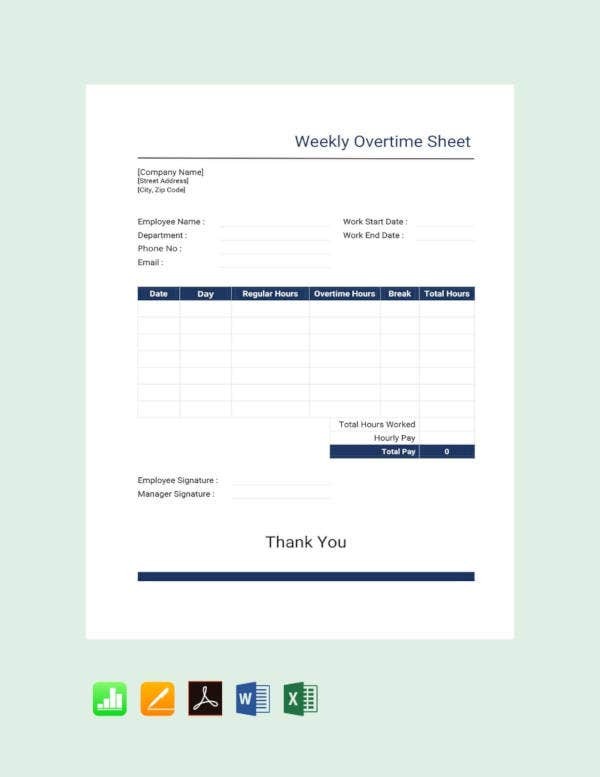 This can range from call sheets to overtime sheets, which a company needs to keep proper records of their employees and their activities, especially if they work longer than they have to. 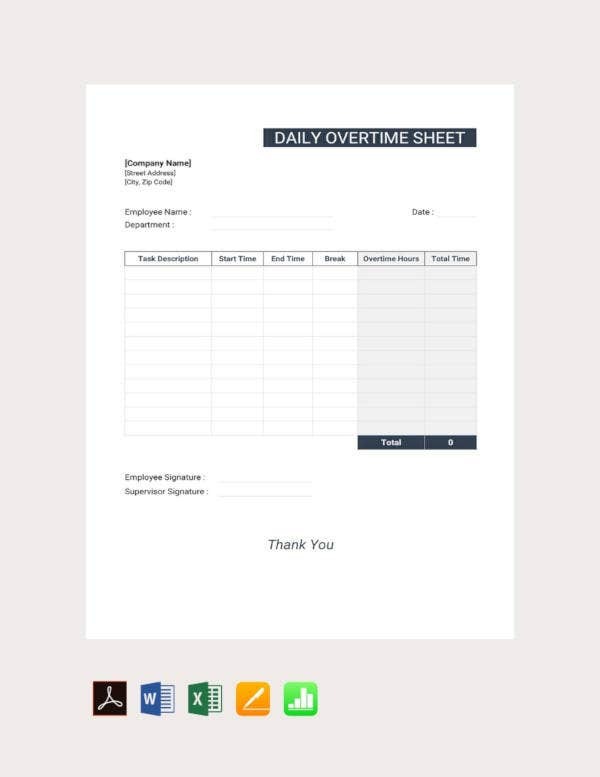 While many sheets, like balance sheets, are directly related to a company’s financial state, an overtime sheet is less so. This is because it is concerned with logging the amount of time spent working overtime. Of course, that would still have an effect on the company’s finances, albeit indirectly. 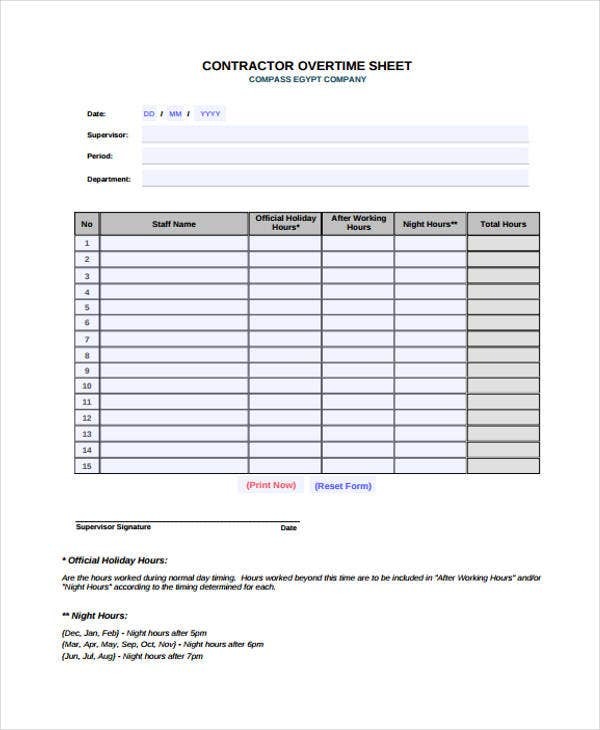 Provide space for the employees to list their names and other identifiers such as employee numbers. 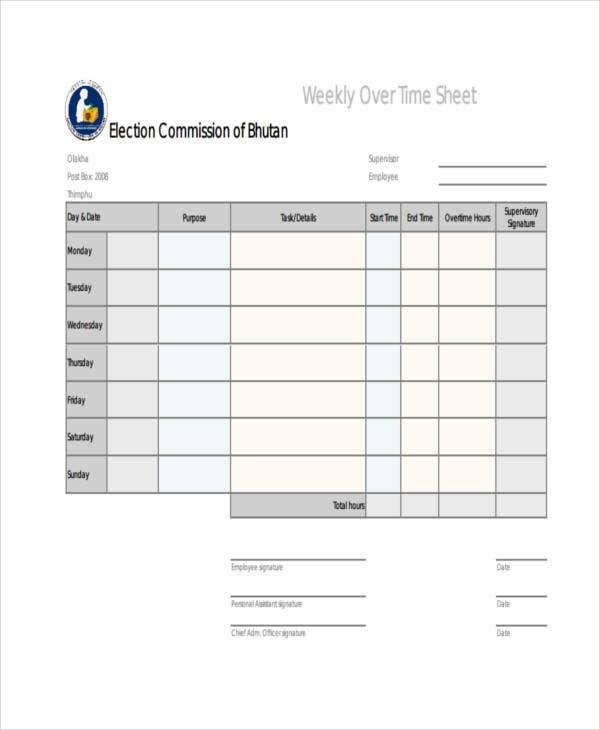 Arrange the sheet in the form of a table. Arrange the categories in the columns. This can include day of the week, start and end times, how many hours per day, etc. 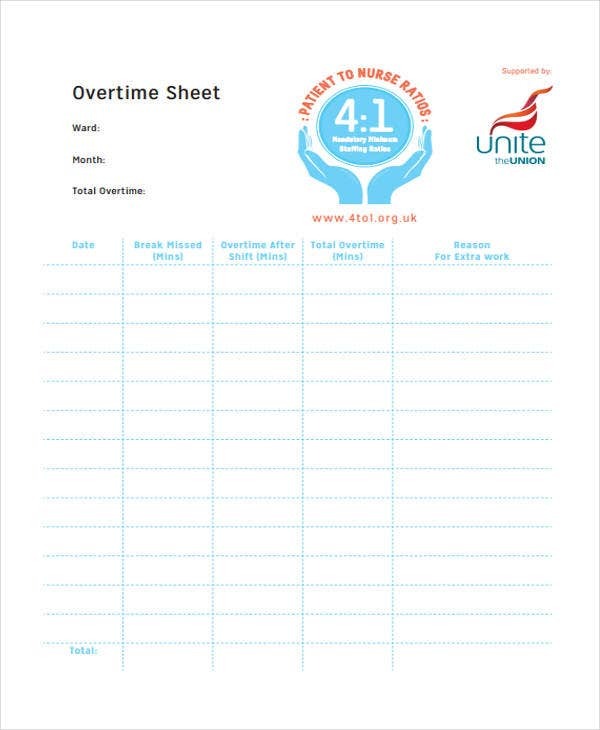 Include a cell for total number of overtime hours for the sheet. 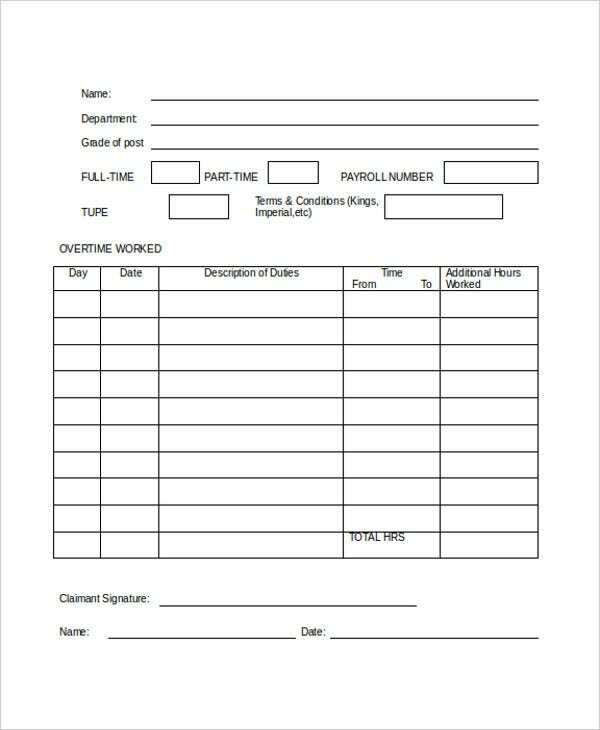 Also include space for the supervisor’s signature, for authorization purposes. 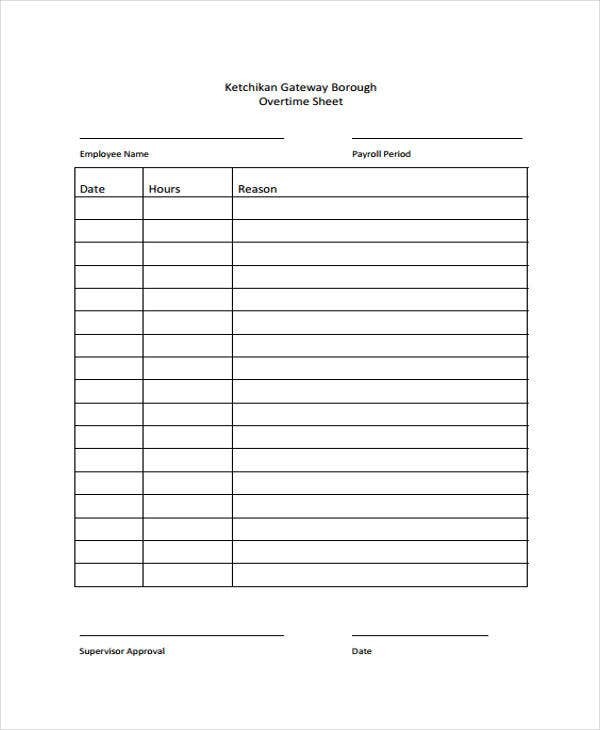 These kinds of templates, along with others like log sheet templates, have very particular uses. While they seem to benefit employees themselves, they have more uses beyond that. They can assist human resources departments, in that it is easier to calculate the payroll for employees who work overtime. They can assist managers in determining who goes the extra mile among employees. 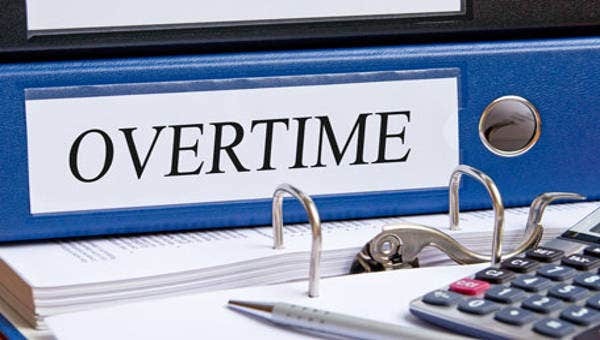 It is also easier for managers to supervise and authorize employee overtime. 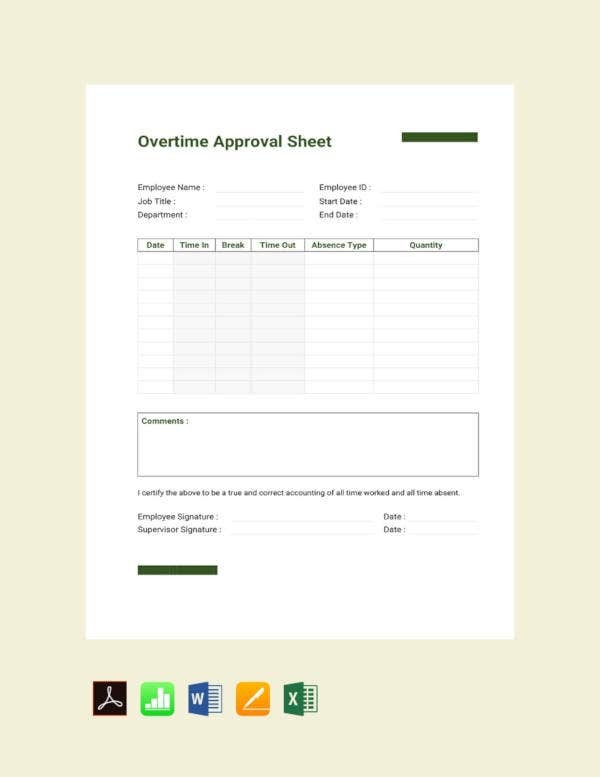 They allow for avoiding overwork by checking to see who works overtime on a regular basis. Do not neglect the supervisor’s signature. 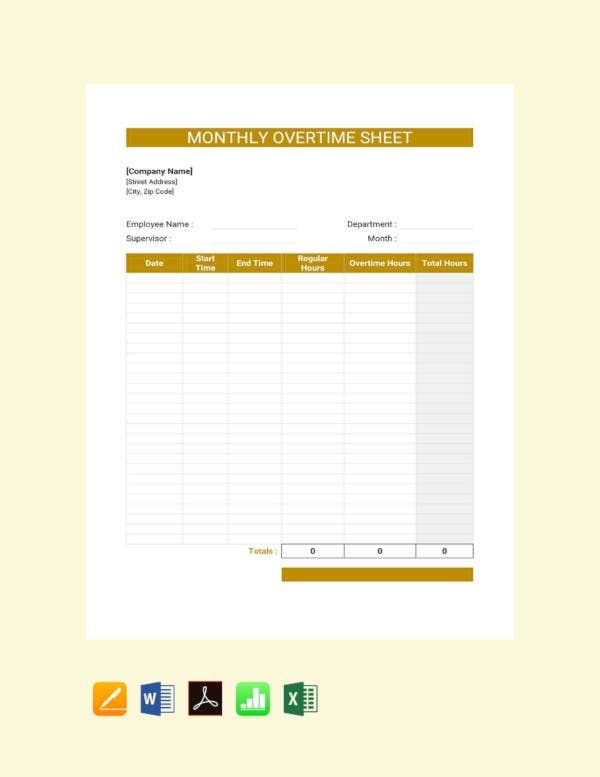 This is necessary for managers to be able to authorize the overtime, if employees’ overtime has to be regulated. Remember to include space for dates and hours worked. 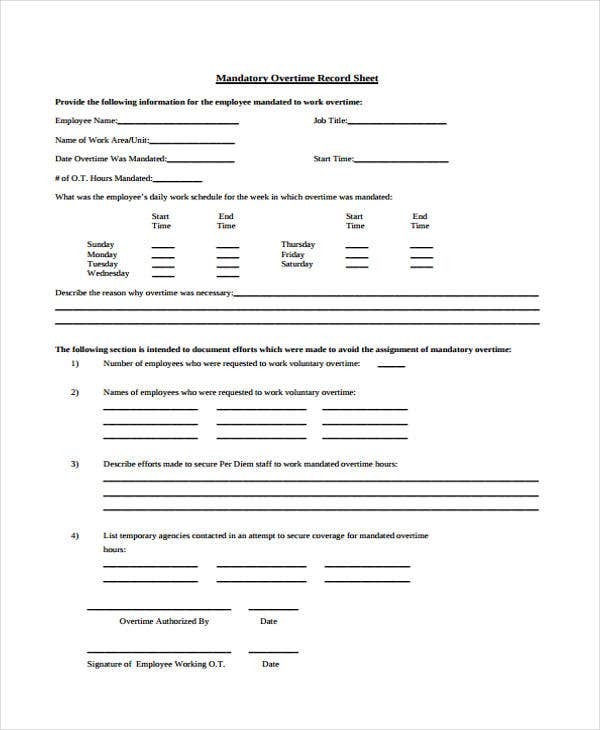 This makes it easy to determine when an employee worked overtime, and to establish patterns if need be. Have space to tally the hours worked. This can make it easier to calculate the payroll since you have a total number of hours. This can also tell you if employees need to be ordered to stop. 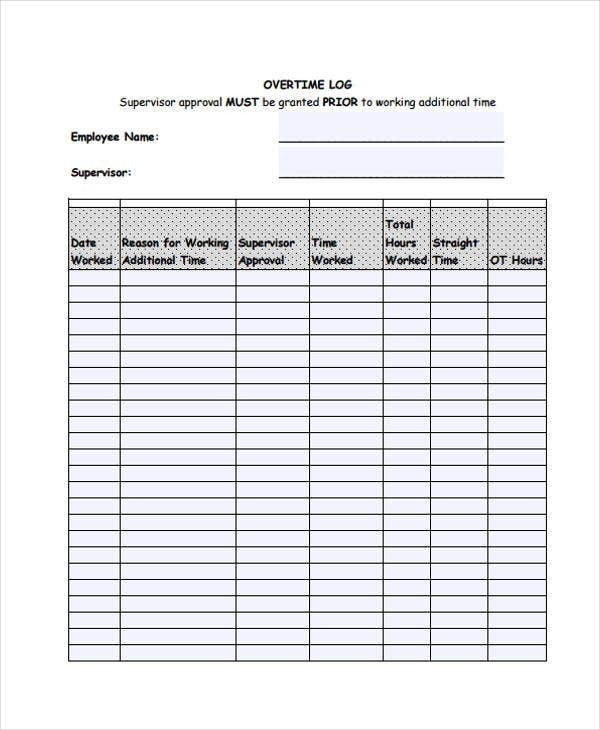 Be sure to include reasons for overtime. 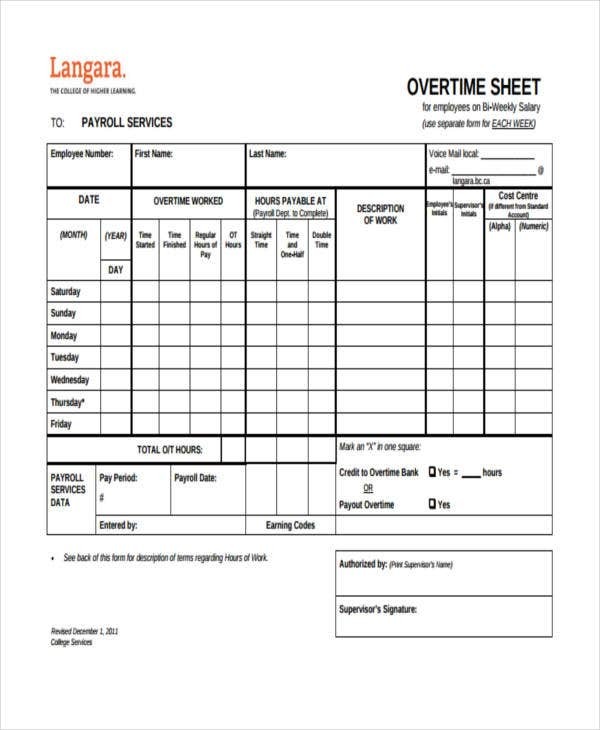 This may be necessary to understand any issues behind the overtime, such as any delays in any projects. Of course, you may also feel free to check on any of the other templates available on the site if your work should need them.